each bearing four peacock feathers [fesswise]. Tycho Brahe's precise naked-eye observations of the motion of the planets paved the way for the accurate mathematical descriptions given by his famous assistant, Johannes Kepler (in the form of three laws that would later be completely explained by Newtonian physics). 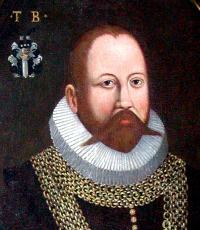 In 1578, Tycho Brahe was awarded the very prestigious Order of the Elephant for services rendered to the Danish Crown. The second scientist to be so honored would be Niels Bohr, in 1947. Early in November 1572, Tycho Brahe was one of many individuals who independently observed a spectacular new star (actually, a Type Ia supernova explosion) in the Cassiopeia constellation. At first, the nova outshone Venus and it would remain visible to the naked eye for more than a year. Tycho was able to show that the phenomenon lacked any measurable observational parallax, which proved that it was located well beyond the confines of the Solar system. The detailed account Tycho gave in De nova et nullius aevi memoria prius visa stella (1573) thus established that the "sphere of fixed stars" was definitely not as immutable as previously thought. Tycho's Nova was one of about 8 supernovae visible to the naked eye in recorded history. Its remnant (SN 1572, or 3C 10) is now mostly a radio source. The two names of Rosenkrans and Gyldenstern stand out because of the pair of Shakespearean characters (Rosencrantz & Guildenstern) in the Tragedy of Hamlet, prince of Denmark, which William Shakespeare (1564-1616) wrote around 1601 (the year Brahe died). The relevant ancestors of Tycho Brahe (ahnentafels #22 and #23) are Erik Rosenkrantz (1427-1503) and Sophie Gyldenstierne (+1477), parents of Kirstine Rosenkrantz (+1509), the maternal grandmother of Tycho Brahe's mother, Beate Bille (1526-1605). 1997: Peter D. Usher (press release). 1999 follow-up. 2001: David P. Stern (quoting Ferguson about the 1592 historical pair). 2003: New Shakespeare Fellowship. Bassanio (quoting Jim Swank). Weirdly, references to the page you're now reading appeared almost simultaneously (October 1, 2006) in 3 different discussions of this issue. Within 3 days, we had acknowledged all of those, here. A funny thermal equilibrium about reciprocal credits was even quickly reached with the thread started by Baez (without private contacts). 2006: Zeborah Fitchett, Tim Silverman, Brian M. Scott (quoting this page). 2006: John Baez (picture link, quote of Eric Altschuler), Tim Silverman. 2006: Banubula (a former study partner of Eric Altschuler at Harvard). The above portrait was engraved in copper in Amsterdam in 1586, and was used extensively by Tycho Brahe in his own publicity... In 1590, Tycho sent 4 copies of it (along with 2 copies of his 1588 book) to a prominent member of Merton College, namely: Thomas Savile (d. 1593) brother of the warden of the College, Sir Henry Savile (1549-1622). Tycho Brahe was apparently craving for English epigrams and he suggested that some excellent English poets might compose them to praise him and his work... Tycho Brahe asked Savile to be remembered to the mathematician John Dee (1527-1609) and also to Dee's pupil Thomas Digges (1546-1595). 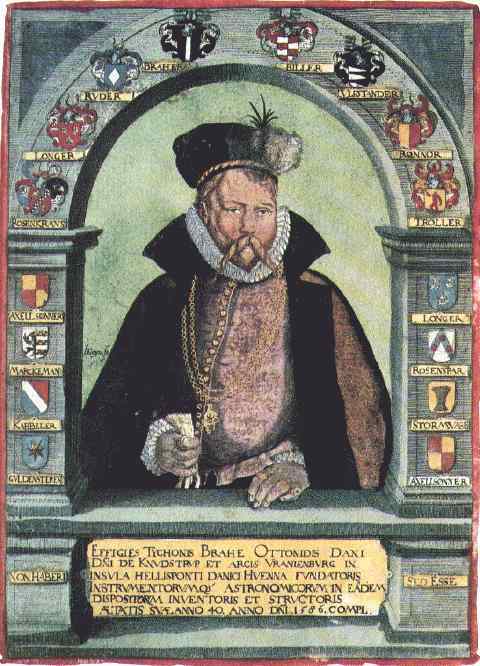 Back in 1938, the renowned Shakespeare researcher Leslie Hotson argued that Shakespeare obtained much of his knowledge of Science from Thomas Digges and might have learned of Tycho Brahe (and the above portrait) through Digges. A dubious legend has it that Tycho died from a burst bladder after a banquet where he refrained from leaving the table to relieve himself, which would have been a breach of etiquette. Actually, Tycho fell ill at that banquet (on October 13, 1601) and found himself in a medical condition which made it painful and difficult for him to urinate. He died 10 days later.